The term originates from the French gargouille, which in English is likely to mean "throat" or is otherwise known as the "gullet"; cf. Latin gurgulio, gula, gargula ("gullet" or "throat") and similar words derived from the root gar, "to swallow", which represented the gurgling sound of water (e.g., Portuguese and Spanish garganta, "throat"; gárgola, "gargoyle"). It is also connected to the French verb gargariser, which shares a Latin root with the verb "gargle" and is likely imitative in origin. 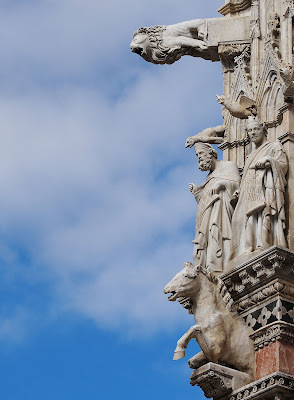 The Italian word for gargoyle is doccione or gronda sporgente, (but also gargolla o garguglia, when it has a grotesque shape) an architecturally precise phrase which means "protruding gutter." When not constructed as a waterspout and only serving an ornamental or artistic function, the correct term for such a sculpture is a grotesque, chimera, or boss. There are also regional variations, such as the hunky punk. Just as with bosses and chimeras, gargoyles are said to frighten off and protect those that it guards, such as a church, from any evil or harmful spirits. However, in common usage, the word "gargoyle" is generally used to describe any monstrous sculpture, whether intended as a waterspout or not. A French legend that sprang up around the name of St. Romanus (Oct. 23; c. 631 – 641 AD), the former chancellor of the Merovingian king Clotaire II who was made bishop of Rouen, relates how he delivered the country around Rouen from a monster called Gargouille or Goji. La Gargouille is said to have been the typical dragon with bat-like wings, a long neck, and the ability to breathe fire from its mouth. There are multiple versions of the story, either that St. Romanus subdued the creature with a crucifix, or he captured the creature with the help of the only volunteer, a man condemned to death. In each, the monster is led back to Rouen and burned, but its head and neck would not burn due to being tempered by its own fire breath. The head was then mounted on the walls of the newly built church to scare off evil spirits, and used for protection. In commemoration of St. Romain, the Archbishops of Rouen were granted the right to set a prisoner free on the day that the reliquary of the Saint was carried in procession, to honored the condemned man who helped him; this lasted until 1790. The term gargoyle is most often applied to medieval work, but throughout all ages some means of water diversion, when not conveyed in gutters, was adopted. In Ancient Egyptian architecture, gargoyles showed little variation, typically in the form of a lion's head. 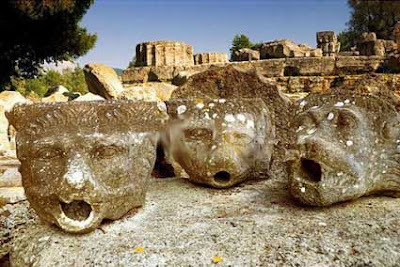 Similar lion-mouthed water spouts were also seen on Greek temples, carved or modelled in the marble or terracotta cymatium of the cornice. An excellent example of this are the 39 remaining lion-headed water spouts on the Temple of Zeus. There were originally 102 gargoyles or spouts, but due to the heavy weight (they were crafted from marble), many snapped off and had to be replaced. Many medieval cathedrals included gargoyles and chimeras. The most famous examples are those of Notre Dame de Paris, although the gargoyles there only date to the ,mid-19th century after a restoration project. 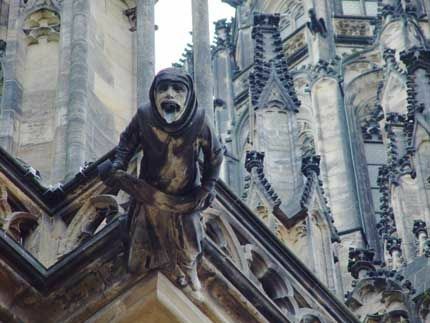 Although most have grotesque features, the term gargoyle has come to include all types of images. 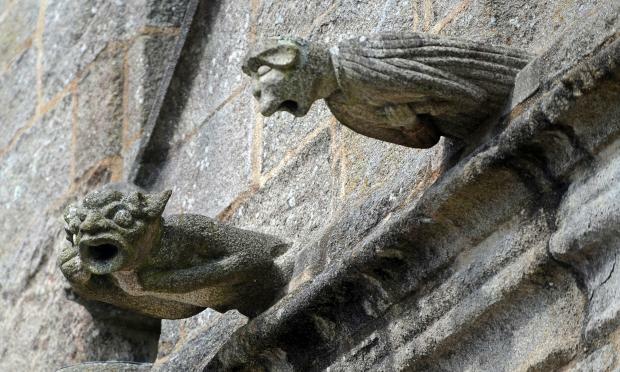 Some gargoyles were depicted as monks, or combinations of real animals and people, many of which were humorous. Unusual animal mixtures, or chimeras, did not act as rainspouts and are more properly called grotesques. They serve more as ornamentation, but are now synonymous with gargoyles. According to Lester Burbank Bridaham, writing in Gargoylaes, Chimeres and the Grotesque in French Gothic Sculpture, "There is much symbolism in the sculpture of the Gothic period; but we must be wary of reading in too much meaning." The ancient Egyptians, Greeks, Etruscans and Romans all used animal-shaped waterspouts. During the 12th century, when gargoyles appeared in Europe, the Roman Catholic Church was growing stronger and converting many new people. Most of the population at this time were illiterate, and therefore images were very important to convey ideas. Many early gargoyles depicted some version of a dragon, especially in France. In addition to serving as spouts for water, the gaping mouths of these gargoyles evoked the fearsome destructiveness of these legendary beasts, reminding the laity of the need for the Church's protection. Human qualities were sometimes ascribed to specific animals — that is, the animals were anthropomorphized. This was especially common for pagans, and using these ideas helped conversion to Catholicism. Some animals (such as the rhinoceros and the hippopotamus) were unknown in western Europe during the Middle Ages so gargoyles of these species (such as the ones at Laon Cathedral) are modern gargoyles and therefore did not have symbolic meaning in Medieval times. Source: with some editing by J.S.